The Center • A Place of HOPE’s unique whole-person approach to counseling and treatment helps individuals achieve long-lasting success from their eating disorders. Our emphasis is on whole person care, treating the entire you – Emotional Balance, Intellectual Discovery, Relational Healing, Physical Wellness, Nutritional Support, and Spiritual Renewal. We offer a world renown specialized intensive treatment program that lasts 4-12 weeks with an acclaimed transitional care program after your intensive treatment. Unlike many other treatment programs, most of your time is spent in personalized individual counseling instead of group sessions. Located a few miles outside of Seattle, Edmonds is a beautiful beach town with majestic views in a village-like setting. Rather you like the city life or the great outdoors, there is plenty to enjoy during your time in the great Pacific Northwest. Some programs for eating disorders admit only women, especially those for anorexia recovery and bulimia recovery. That is not the case here at The Center where we have a program just for men that incorporates treatment specific to their unique needs when suffering with anorexia nervosa, bulimia nervosa or binge eating disorder. So, if you are a male with an eating disorder, there is Hope for You! 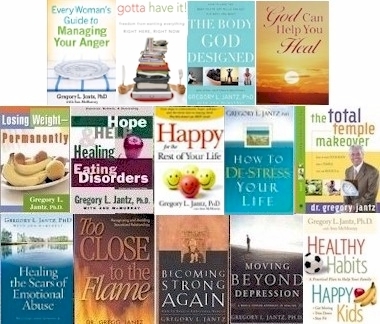 Browse Eating Disorder Books Here! Twenty-five years ago, eating disorder specialist Dr. Gregg Jantz had a vision of Hope. Trained in counseling, he looked at the treatment options available and realized something was missing. In all areas of need from eating disorders to depression hurting people went to a doctor, a psychiatrist, a counselor, and a pastor, going from place to place looking for Hope, help and healing from their pain. At each junction, they received help for a piece of the puzzle, but that puzzle often remained unsolved. Instead of settling for fractured care, Dr. Jantz created The Center • A Place of HOPE. The Center is a world-renowned dually licensed facility specializing in whole-person care. There, people find comprehensive, coordinated care from treatment team using a whole-person model “inspired healthcare” addressing medical, physical, psychological, emotional, nutritional, fitness and spiritual factors involved in recovery. Elements of the above-referenced programs for eating disorders are tailored to the unique needs of anorexics, bulimics and compulsive overeaters in our Adolescent Eating Disorder Program. This may include help for parents and families as well whose loved ones are suffering with eating disorders. For adolescents and older teens who need assistance in continuing their academic studies while at The Center for eating disorders recovering from anorexia, bulimia or binge eating, we can arrange for a state-certified teacher as an academic tutor. Time for studying will be worked into the program accordingly. Upon completion of each recovery program for eating disorders, weekly telephone sessions for 3-6 months are recommended. This is beneficial to recovery and relapse prevention of eating disorders, solidifying recovery skills and providing a venue to discuss ongoing challenges and successes with anorexia recovery, bulimia recovery, and compulsive overeating recovery. You won’t find cookie-cutter solutions or canned responses at The Center. Each person is unique and we take the time to get to know you personally, even before you arrive for your Intensive Treatment Program for Eating Disorders. That means understanding your situation and fully addressing questions or concerns so you can make the decision for for anorexia recovery, bulimia recovery or overeating recovery. We promise to provide an atmosphere of respect and trust in all interactions with you, from the first phone call to the heartfelt good-byes when you return home. We have a variety of excellent housing options available for your time with us. There is No additional costs for lodging. Housekeeping / Laundry / Linen Service Provided. Fully Equipped Kitchens. See our lodging here. Charges are a per diem rate for Day Treatment. We will work with your insurance providers to minimize any out-of-pocket expenses to you. We are not a Medicare or Medicaid provider. Our finance department will work directly with you and your insurance. Is cost an issue? Don’t let it be. We have financing and scholarship programs available. We would like to spend time discussing this information with you and answering your questions about our treatment program for eating disorders. Call today 1-888-884-4913 / 425-771-5166 to speak with an eating disorder specialist. It is a free, confidential call. Or just fill out the form on the right side of the page and a specialist will be in contact with you shortly. We believe and understand that Hope is available for every person. In 24 years of treatment, we’ve seen countless miracles of God’s grace, manifested through our whole-person care for addictions and other issues. We have assembled a comprehensive recovery team of psychologists, licensed counselors, a certified eating disorder specialist, medical personnel, board certified psychiatrist, dieticians, licensed social workers, depression experts, licensed marriage and family therapists, certified chemical dependency professionals, massage therapists, RN, fitness trainer and various specialists. Our team represents the very best in treatment professionals who are called into the ministry of Hope and Healing. Our life-affirming treatment for addictions and other issues has been endorsed by many experts, including Dr. Abram Hoffer, M.D., Ph.D., one of the world’s foremost psychiatrists. Read Dr. Hoffer’s Review of our whole-person approach in theJournal of Orthomolecular Medicine. We understand addictionandrecovery. Our Hope-filled treatment recovery programs work with some of the most challenging issues anorexia, bulimia, compulsive overeating, binge eating, obesity, bi-polar disorder, and addictions of all types. Those who have been helped through The Center’s whole-person treatment approach for addictions and other issues are willing to share their experiences. Read their testimonials or request to speak with someone yourself.